This is a beautiful 1835 map of the British Islands by the important American mapmaker T. G. Bradford. It includes England, Scotland, Wales and Ireland and covers from the southern tip of the Shetland Islands to the Scilly Isles in the south. This map notes towns, rivers, mountains, canals, and various other important topographical details. Elevation throughout is rendered by hachure and political and regional territories are color coded. 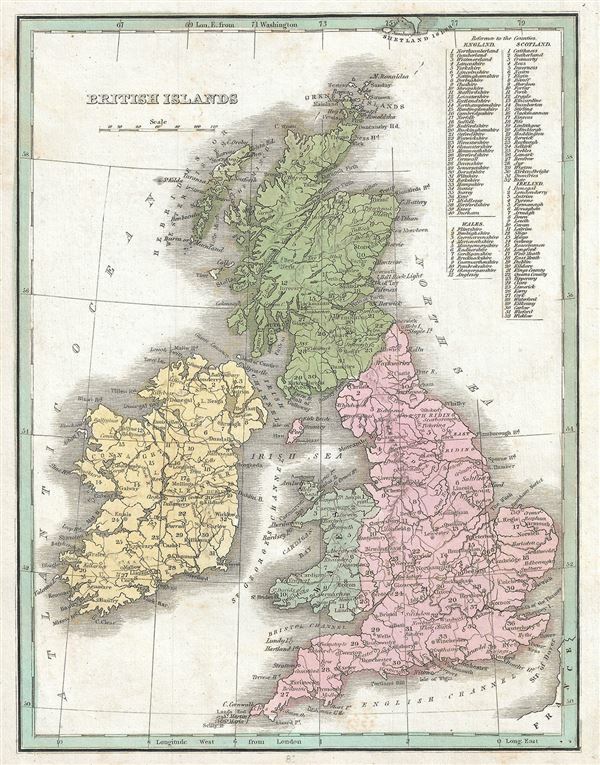 As this map was being printed, the Kingdom of Great Britain and the Kingdom of Ireland had already amalgamated into a single political entity. England and Scotland were in the midst of the Industrial Revolution. Though England and Scotland flourished throughout the 19th century, Ireland suffered a series of famines, the worst being the Great Irish Famine, which lasted from 1845 – 1849 and killed about a million people. This map was published as plate no. 81 in Thomas G. Bradford's 1835 Comprehensive Atlas Geographical, Historical and Commercial. Bradford's atlas, published in 1835 was an important work on many levels. First, it was one of the first American atlases to follow an encyclopedic format, offering readers extensive geographical and statistical tables to supplement the maps themselves. Second, it was published in Boston and influenced the city's rise as a publishing center later in the 19th century (at the time most publishing in the United States was restricted to New York and Philadelphia). Third, this atlas was the first to contain a separate and specific map showing the Republic of Texas. Fourth and finally, Bradford's atlas in some instances broke the Euro-centric mold regarding atlas production. Among other things, Bradford focused his atlas on the Americas and abandoned the classical decoration common in European atlases in favor of a more informational and inherently American approach.